Salvage divers work the Chao Phraya River near Wat Kanalaya. 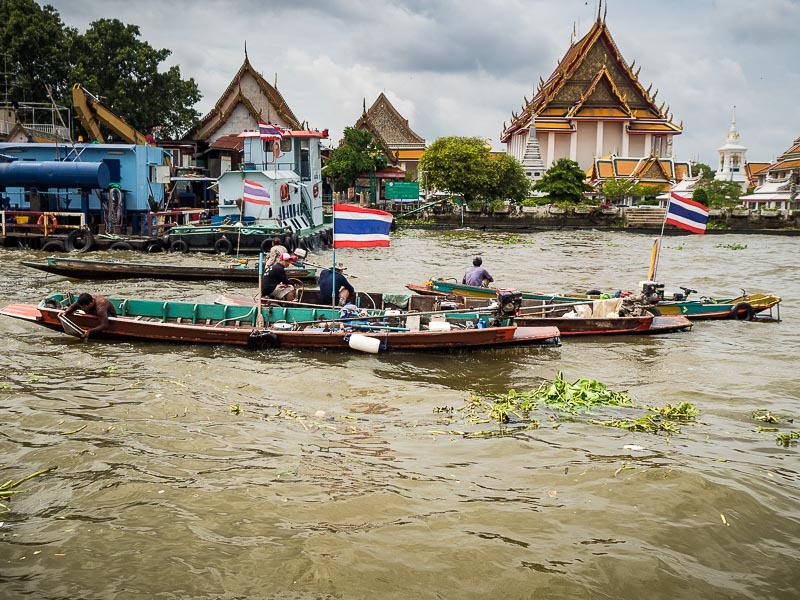 There's an active dive community in Bangkok. 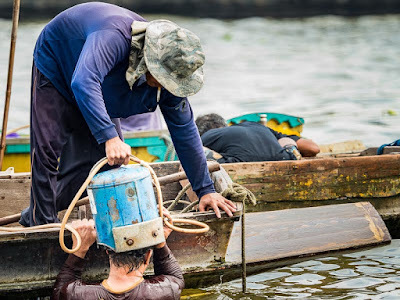 These aren't sport divers, but salvage divers who, working out of small boats, barely bigger than a canoe, dive the Chao Phraya River looking for things they can salvage and sell. It's dangerous, low paying work and not something tourists usually see. 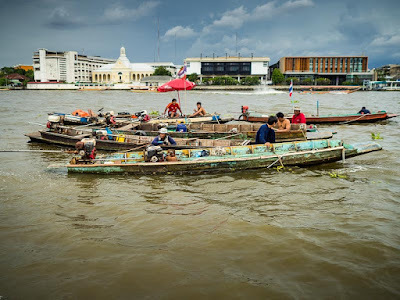 The Chao Phraya, especially in Bangkok, is a dangerous river. It's fast flowing and unpredictable. It's very deep (deep enough for ocean going ships to navigate, though they don't come upriver anymore because they can't get past the low bridges) and busy. 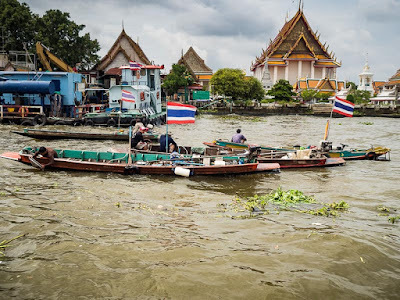 Passengers boats go up and down the river all day long, ferries crisscross the river and huge barges haul commodities from the countryside into Bangkok. And it's polluted. A diver slips into the river. I've seen the divers working the river but never photographed them because they were always working in places where I couldn't reach them. This week though there's a group of divers working off the Wat Kalayanamitr pier. I could reach them with a long lens (my 40-150 f2.8 zoom and teleconverter) and the cross river ferry took me close enough to the divers that, working fast, I could use wide angle lenses for establishing shots. 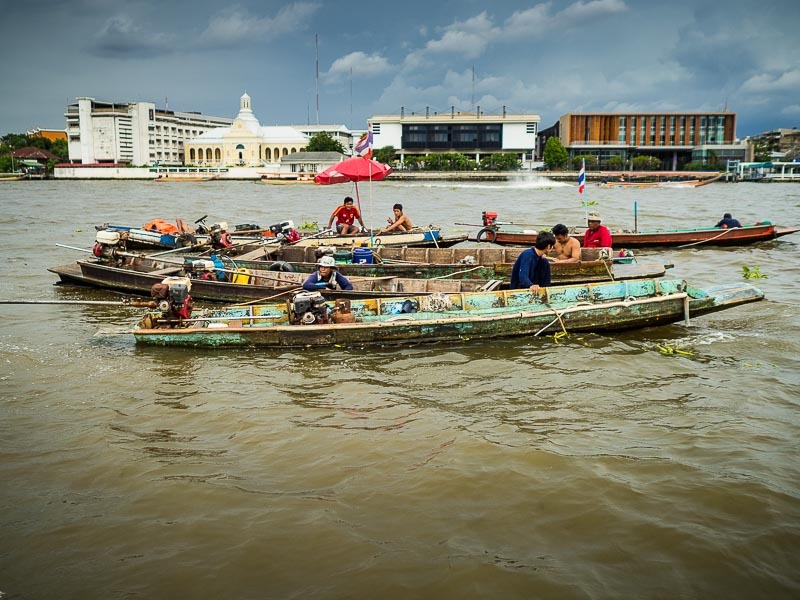 Reverse angle of the first picture, made as the ferry returns to the Bangkok side of the river. That is Wat Kalayanamitr in the background. I spent a couple of hours photographing the divers. It's not an easy way to make a living. Their dive "helmets" are homemade contraptions. Air is forced into the helmet by a compressor in the canoe boat. They walk along the river bottom, in what is a dark, muddy environment picking up what they can while a spotter waits for them in the boat. 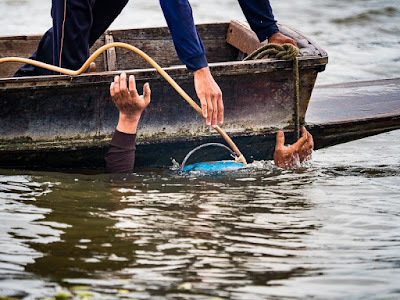 After 20 - 30 minutes on the river bottom divers surface with their treasures. They rinse and sort them in the boat, drink a Red Bull (invented in Thailand), put the helmet back on and disappear again into the deep. 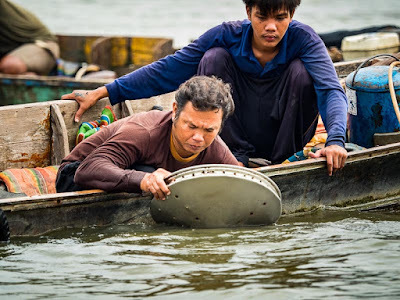 Rinsing and sorting in the canoe boat. There are logistical challenges to photographing a story like this. I had to use my longest lenses for most of the photos and I don't normally like to work with a long lens. It's not how I see. But the only way I could have gotten closer would have been on a boat. I didn't even ask the divers if I could join them - it would have been to unsafe for them. Their boats are very unstable and I am not very graceful. I would, more likely than not, have tipped the boat trying to get into position for a picture. I want to spend more time with the divers. They seem like a friendly bunch. They were waving at me and shouting greetings and not camera shy. I plan to go back and photograph them some more, only I will make arrangements to rent a small boat that can navigate in amongst the divers without causing problems. There are more photos of the divers in my archive.